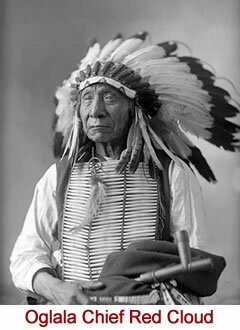 Red Cloud, chief of the largest tribe of the Teton Sioux Nation, achieved early fame as a warrior and yet was one of the most influential Indian leaders to urge peace with the U.S. government. In 1870 Red Cloud visited the East, at which time be gave the following speech at a reception in his honor at Cooper Union in New York on July 16. Though a persistent critic of the government and of its Indian agents, whom be charged with graft and corruption, Red Cloud only opposed agitation for further wars that, he knew, would only result in losses for his people. MY BRETHREN AND MY FRIENDS who are here before me this day, God Almighty has madep us all, and He is here to bless what I have to say to you today. The Good Spirit made us both. He gave you lands and He gave us lands; He gave us these lands; you came in here, and we respected you as brothers. God Almighty made you but made you all white and clothed you; when He made us He made us with red skins and poor; now you have come. When you first came we were very many, and you were few; now you are many, and we are getting very few, and we are poor. You do not know who appears before you today to speak. I am a representative of the original American race, the first people of this continent. We are good and not bad. The reports that you hear concerning us are all on one side. We are always well-disposed to them. You are here told that we are traders and thieves, and it is not so. We have given you nearly all our lands, and if we had any more land to give we would be very glad to give it. We have nothing more. We are driven into a very little land, and we want you now, as our dear friends, to help us with the government of the United States. The Great Father made us poor and ignorantmade you rich and wise and more skillful in these things that we know nothing about. The Great Father, the Good Father in Heaven, made you all to eat tame foodmade us to eat wild foodgives us the wild food. You ask anybody who has gone through our country to California; ask those who have settled there and in Utah, and you will find that we have treated them always well. You have children; we have children. You want to raise your children and make them happy and prosperous; we want to raise and make them happy and prosperous. We ask you to help us to do it. At the mouth of the Horse Creek, in 1852, the Great Father made a treaty with us by which we agreed to let all that country open for fifty-five years for the transit of those who were going through. We kept this treaty; we never treated any man wrong; we never committed any murder or depredation until afterward the troops were sent into that country, and the troops killed our people and ill-treated them, and thus war and trouble arose; but before the troops were sent there we were quiet and peaceable, and there was no disturbance. Since that time there have been various goods sent from time to time to us, the only ones that ever reached us, and then after they reached us (very soon after) the government took them away. You, as good men, ought to help us to these goods. Colonel Fitzpatrick of the government said we must all go to farm, and some of the people went to Fort Laramie and were badly treated. I only want to do that which is peaceful, and the Great Fathers know it, and also the Great Father who made us both. I came to Washington to see the Great Father in order to have peace and in order to have peace continue. That is all we want, and that is the reason why we are here now. In 1868 men came out and brought papers. We are ignorant and do not read papers, and they did not tell us right what was in these papers. We wanted them to take away their forts, leave our country, would not make war, and give our traders something. They said we had bound ourselves to trade on the Missouri, and we said, no, we did not want that. The interpreters deceived us. When I went to Washington I saw the Great Father. The Great Father showed me what the treaties were; he showed me all these points and showed me that the interpreters had deceived me and did not let me know what the right side of the treaty was. All I want is right and justice. . . . I represent the Sioux Nation; they will be governed by what I say and what I represent. . . .
Look at me. I am poor and naked, but I am the Chief of the Nation. We do not want riches, we do not ask for riches, but we want our children properly trained and brought up. We look to you for your sympathy. Our riches will . . . do us no good; we cannot take away into the other world anything we have - we want to have love and peace. . . . We would like to know why commissioners are sent out there to do nothing but rob [us] and get the riches of this world away from us? And I am going to leave you today, and I am going back to my home. I want to tell the people that we cannot trust his agents and superintendents. I don't want strange people that we know nothing about. I am very glad that you belong to us. I am very glad that we have come here and found you and that we can understand one another. I don't want any more such men sent out there, who are so poor that when they come out there their first thoughts are how they can fill their own pockets. We want preserves in our reserves. We want honest men, and we want you to help to keep us in the lands that belong to us so that we may not be a prey to those who are viciously disposed. I am going back home. I am very glad that you have listened to me, and I wish you good-bye and give you an affectionate farewell.